If you’re looking for a good way to improve the ambiance and mood of a room, consider changing your lighting. Lighting has an immense impact on the appearance of a room and your mood while in it. Recent advances in lighting control systems have created incredible options for sculpting the atmosphere of your rooms. New lighting control systems integrate with other appliances and media devices in your house to help you save money and create a striking, modern look to your home. Prices for such systems continue to drop, making them more attractive and sensible solutions to your every day lighting needs. Call us to discover how we can help you with a new lighting control system. Whatever your lighting needs, call Captain Electric, LLC to schedule a free consultation and see just how many options we have for your home or business. What are the different types of lighting Captain Electric can install? Of course, exterior lighting is a great way to highlight your yard, increase safety during the night, and increase the value of your home. Exterior lighting transforms any outdoor space into a place just as important and inviting as any room in your house. Increased visibility in your outdoor spaces increases the safety in other ways. 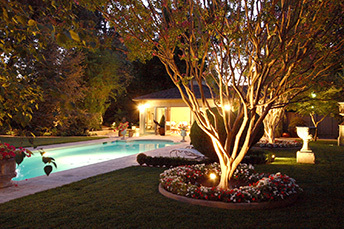 Well-lit yards are known to deter theft and property damage. Choose a comprehensive outdoor lighting solution to keep your home and family safer. If you’re replacing lighting, recessed lighting is a great replacement. Recessed lights provide the same benefits as traditional light fixtures, but lack the visual distraction. Recessed lights are a way to subtly draw attention to design elements without obstructive lighting. LED lighting is an increasingly cost-effective way to light indoor and outdoor spaces, at a fraction of the energy demands of traditional lighting. Though they have a higher initial cost, LEDs last for decades and are a great solution for reducing your electric bill. Ceiling fans are an excellent way to aid central heating and air conditioning, by circulating air around the house. In any season, ceiling fans help to reduce your electric bill by moving air around your home efficiently and quickly. I am not one who usually rates things 5 out of 5. I seem to think there is always room for improvement, not this time. Great job!